List: $89.99 Price: $59.99 /each Save: $30.00! SECOND QUALITY - Don't sacrifice style when choosing your FR clothing! 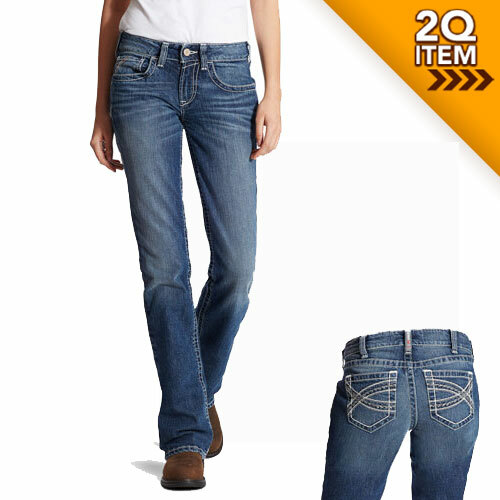 These women's Ariat FR jeans feature a boot cut leg opening with durable stretch denim, allowing ease of movement while you're getting the job done. These FR pants are arc rated 20 cal/cm², making them CAT 2 rated as well as dual certified to NFPA 70E and NFPA 2112. Featuring an embroidered fashion back pocket, no one would know you're wearing your flame resistant gear while out for the night! Good price and good jeans! Bought factory seconds and could hardly tell there were any defects. They were a lot cheaper than what I would normally spend for fr jeans! The quality is good, but they run about 2 inches (almost 3 inches) bigger than sized.